Hi guys, it's a great service you offer. Can it extend to include delivery to France for Magicolor 2430DL toners, and at what cost? Many thanks, Martin. Unfortunately, we can only deliver within the UK. My Magicolor 2400W is on its last legs and all I can find to replace it is a 2430DL printer. Of course, I have some toners for the 2400W that I bought from you left over. Are they compatible with the 2430DL printer please? The Konica Minolta Magicolor 2430DL can be a pleasure to use as the highly functional Konica Minolta Magicolor 2430 DL will ensure that your documents are entirely professional. The Konica Minolta Magicolor 2430DL uses a wide range of Magicolor 2430DL accessories, like the black Konica Minolta Magicolor 2430DL toner cartridge which can run up a large bill as Konica Minolta Magicolor 2430-DL cartridges can be expensive. You can compare the Konica Minolta Magicolor 2430 DL prices to find out just how cheap our Magicolor 2430-DL toner cartridges really are. We have a wide range of Konica Minolta Magicolor 2430DL cartridges to choose from, so try CartridgeSAVE for all your Konica Minolta Magicolor 2430DL toner needs. The Konica Minolta Magicolor 2430DL cartridge comes with free delivery so that you get the most out of buying the Magicolor 2430 DL toner cartridge from us. We are entirely sure that the Konica Minolta Magicolor 2430DL cartridge you receive from us is high quality and satisfactory-and to prove it we send the Konica Minolta Magicolor 2430 DL toner off with a no quibble Konica Minolta Magicolor 2430-DL toner cartridge from us is simple and fast so that you get the most out of your Konica Minolta Magicolor 2430DL toner purchasing experience. The Konica Minolta Magicolor 2430DL printer is an productive workgroup tool that can print in both colour and black and white. At prints speeds of up to 20 pages per minute, this printer can easily handle a medium-sized workload. During colour printing, this printer can reach a maximum speed of five pages per minute. Documents can be created in a resolution of up to 2,400 x 600 dpi for extremely clear prints. The Konica Minolta 2430DL is a printer of small stature that will only require 42.92 cm in width, 50.29 cm in depth, and 34.03 cm in height. This printer is only moderately heavy at a weight of 18.01 kg and can be lifted by a single person. 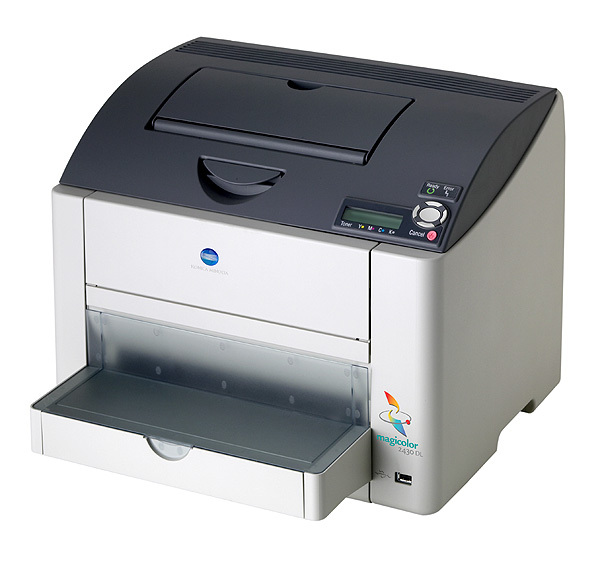 This printer features a ARM 130 MHz processor that will direct print information with efficiency. A 32 MB memory card is primarily used to handle storage and can be upgraded to 544 MB of RAM for improved performance. Konica Minolta 2430DL toner is also estimated to yield precisely 1,500 pages before needing to replaced, although high capacity 2430DL cartridges with a 4,500 page yield are also available. Duplex printing is also available on the 2430DL and will reduce paper consumption over the course of time. The Magicolor 2430DL can also print on plain paper, envelopes, labels, postal card paper, glossy paper, and transparencies. With a monthly duty cycle of 35,000 pages, this printer can manage the workload of any busy office with ease. This printer has an internal print server that will allow connection to more than one computer in a network. This is a relatively affordable printer compared to others in the similar class. The Konica Minolta Magicolor 2430DL does not include a scanner, copier, or fax machine and will not serve much use for anyone who desires multifunctionality. The Konica Minolta Magicolor 2430DL may pose a problem for users who would prefer a quieter printer as it has a sound level of 53 decibels during operation and 35 decibels during idle.